Syracuse, N.Y. – The Syracuse women’s basketball team defeated Drexel 72-62 in the Carrier Dome on Saturday. The Orange the struggled in the first half but rallied to extract revenge over the Dragons that beat them in a 62-61 heartbreaker just a year ago. The Orange collected their tenth straight win to begin the season; this is the first 10-0 start the team has seen since the 2009-10. The team went on to win 12 straight en route to an eventual 25-11 finish that season. Syracuse had five players hit double digits in the game; two with double-doubles. Digna Strautmane put up a career-high 19 points and hauled in 11 rebounds for her second double-double of the season. “She was fantastic tonight on the offensive end, and defensively she did a really good job of staying in front of her man and walling up on defense,” Coach Hillsman said. Tiana Mangakahia continued a strong effort this year. She played through a slow first half that saw her only make one shot in six attempts and score seven points. Through the second half she made four of her five shots and finished with 16 points. She also put up a double-double with ten assists. Miranda Drummond scored 17 points and grabbed eight boards. 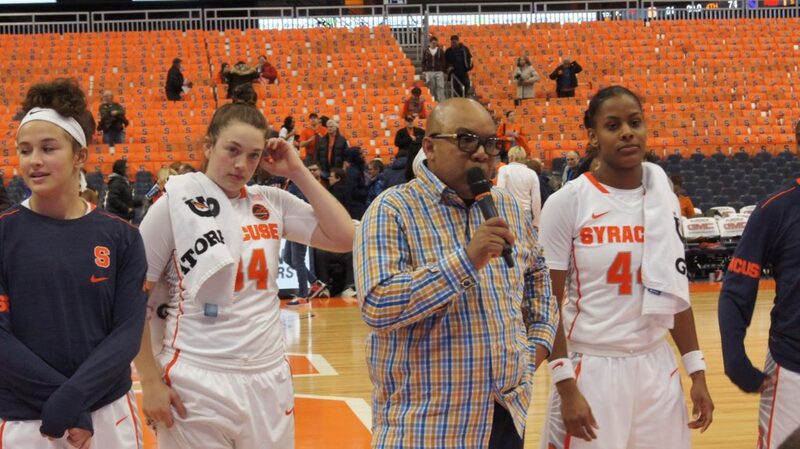 Gabrielle Cooper and Isis Young both helped the Orange scoring threat with ten points. Syracuse struggled offensively in the first half with inefficient scoring and turnovers. At the half, Syracuse was shooting just under 34% compared to Drexel’s impressive 58%. Three-pointers were not falling for the Orange. The team made only four-of-16 through 20 minutes. Drexel’s offensive efficiency translated well to behind the arc, as the Dragons converted five-of-nine from deep. Senior guard Megan Marecic accounted for all of Drexel’s threes in the first half. She had 15 points at the half. Syracuse’s inside scoring was also outmatched by Drexel. The Orange could not stop the inside pass in the first half, giving up 20 points in the paint. On the other end, they could not match the effort, only scoring 10 under the basket. When the second half began, it looked like two entirely different teams stepped onto the court. The Orange outscored Drexel 21-to-eight in the third quarter, and got a strong performance from freshman forward Digna Strautmane’s nine points and five rebounds in the quarter. The shots started to fall for Syracuse, who surged in the second half, shooting 58% from the field and 46% from deep. They outscored the Dragons 39-21 in the second half. Drexel did not have nearly the success they had in the first half. The Dragons only made a single three point shot and finished the game shooting six-for-21. Marecic, who was lights out in the first 20 minutes, missed all four attempts from deep in the second half. The Dragons also shot an abysmal 28% from the floor in the second half, making only nine-of-32 tries. Under the basket, the team was also not able to repeat its success, and was outscored by Syracuse 20-16.